Urban park design has provided some incredible green transformations in the last few years. As landscape design merges more closely with building architecture, we’re seeing parks that push the elements of landscape design to the next level. But park design does have its limits, and the biggest limit is almost always a lack of available land area. In increasingly dense urban areas, sometimes the only way to combat space limitations and take a park to the next level of design is to send the green space skywards. One of the best examples of the beauty and awe of vertical parks is the MFO Park in Switzerland. With multi-dimensional sides, stairs, platforms and sundecks, visitors are able to completely immerse themselves into the park. They can climb the main structure, see amazing views of the open space and observe the incredible greenery. Vertical parks and green roofs are becoming so popular as a way of making use of vertical space that they are almost the standard for new buildings now. Major city works, residential complexes and office building complexes almost always have a natural, green vertical garden incorporated into the design. Combine that with the growing health movement to grow and eat our own food, and we now see many vertical vegetable gardens emerging on top of residential apartment buildings. 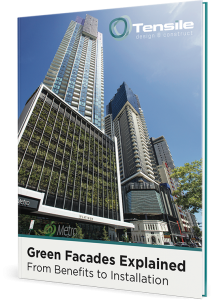 As urban vertical gardens have evolved, they have become a great contributor to the function of a building. They provide thermal insulation properties to reduce energy costs and improve the air quality of the local environment. They can provide shade to a building as well as increase the biodiversity. 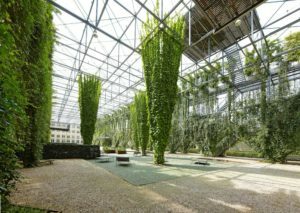 Whilst some remarkable vertical gardens have been built in recent years, it is exciting to think of what they might be like in another decade when green architecture pushes the boundaries even more. If you’re considering a vertical garden as part of your next project build, speak with us for a consultation.